I guess it’s really winter. At least in Taylor Bay. Honour froze the bay, made it snow, and in general forced me to find my winter clothing. My inventory is a disaster but “search” found winter clothing, boots and even gloves!!! But that’s not enough warmth for me. 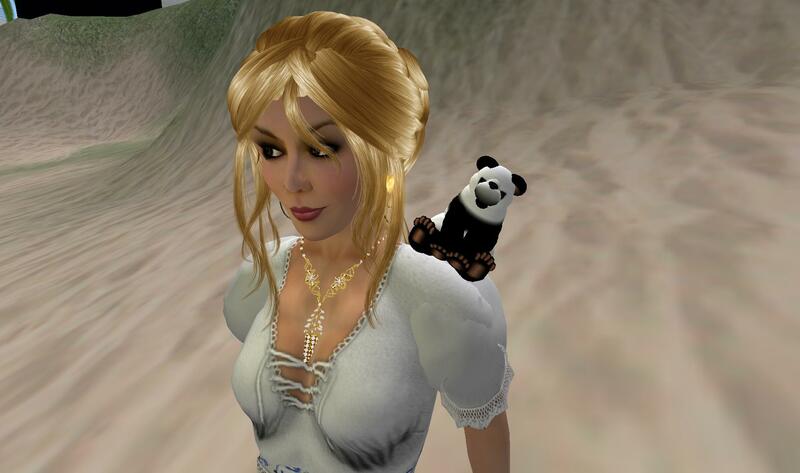 Honour found me huddled by the burning barrel. 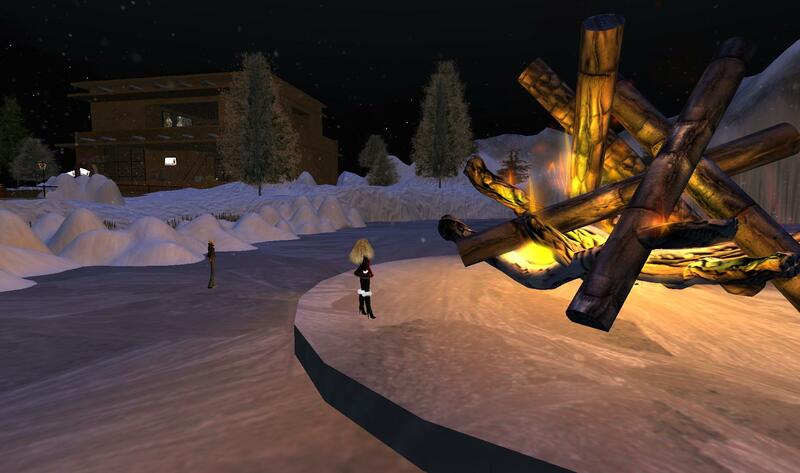 After scoffing at me, she suggested we move by the REAL fire – the bonfire. So having admired the fire particles in the barrel, I went off to stand by the heat of the bonfire. Honour is being the consummate hostess. 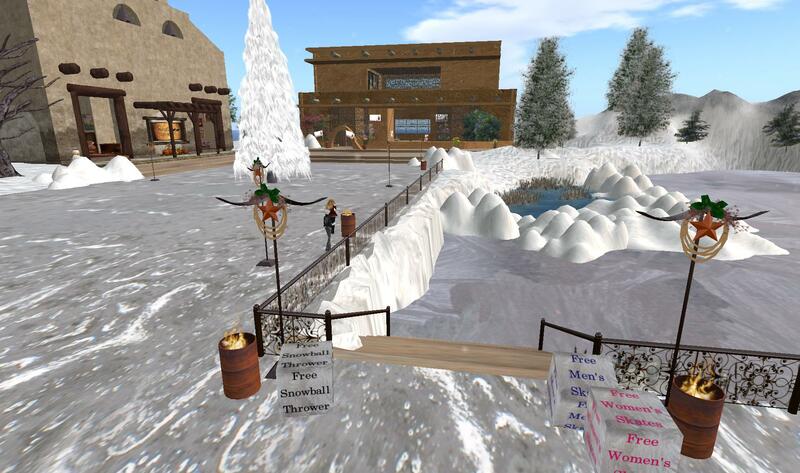 She has put out free skates for all PLUS a snowball fight. 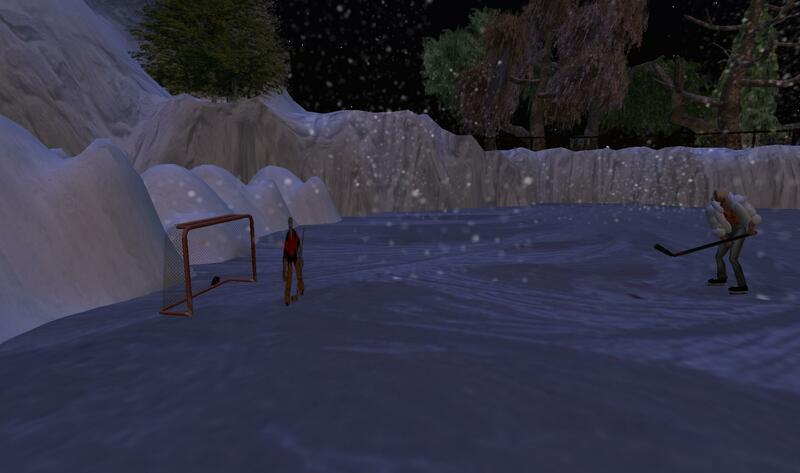 Since she is Canadian, she felt compelled to put out hockey. I confess I do NOT see the appeal of this sport. Probably because the arenas are too darn cold for me to go to a live game. 🙂 I’m just not good at doing cold. But hey, this is SL, so I was a good sport and agreed to try the hockey. OMG. Could the skates be any uglier????? No wonder I couldn’t move. My feet rebelled in shame. 🙂 I tried to get the dumb puck into the dumb net. Even in SL I have absolutely no aim or control. LOL. You should see me bowl. Although I AM good at baseball – I can indeed slam that ball. Go figure. I tried my best to score a goal but the ugly skates prevented me from functioning. That’s my story and I’m sticking to it. I changed to my “real” skates so I could function properly, in Ahuva-style. Faust came inworld to join us. He really needs some winter clothing. I found a man’s ski jacket and passed it to him, but I wish he’d wear a warmer shirt. Sheesh. I nearly had to go back to the bonfire I got so cold looking at him with no gloves and an open jacket. Faust soon figured out the sweet spot on the ice and was making goal after goal. He’s up on the leaderboard! You’ll need to head to Taylor Bay to see if you can beat his score. Me – I’m looking for wherever it is Honour has the hot cocoa. I’ll curl up there and watch the hockey in warmth and comfort. Although the conference is over and was a success (not just my opinion – I am getting unsolicited feedback saying the same thing), there are still some things I’d like to share. One of the managers had mentioned that a regatta would be a fun thing to organize for the conference. The schedule was very tight, it was not immediately apparent where we could add a regatta, but I went ahead and setup all the fundamentals anyway. *grin* I LOVE doing the fun, social things. Maybe you’ve noticed that? I recruited a good friend and coworker who knew how to sail. 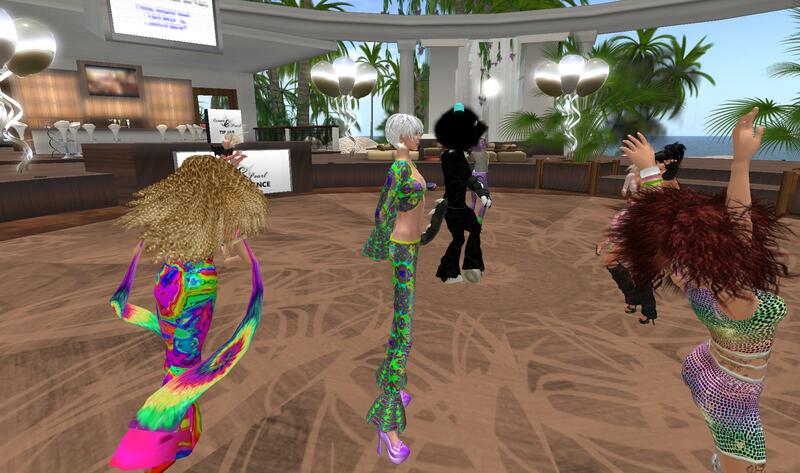 I knew he was “one of us” immersive types when within 2 hours of being inworld he was changing his clothes and making his hair purple. Keith explained to me about real regattas and then we took off sailing in our world to see how best to adapt real to virtual. We created a course around the world. I made the inevitable t-shirt. Created a gold doubloon necklace to be retrieved half-way around the course. 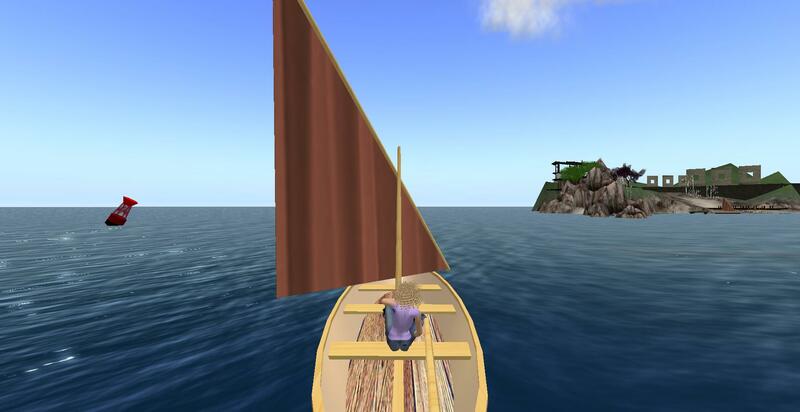 Created maps and textures showing how to use the inworld map to navigate. We had rules and everything. *grin* Unfortunately, but not unexpectedly, we never got to run the regatta. There was too much else happening. But now I have a regatta in my back pocket for the NEXT event. *grin* I just need to make the winner’s trophy and the start/finish line and a count-down clock for all to see. I sailed the course several time for practice and to prepare the help textures. I realized that the water was beautiful but something was missing. A buoy!!!! *grin* No sooner thought than built. I’m getting better at this building stuff, I really am. 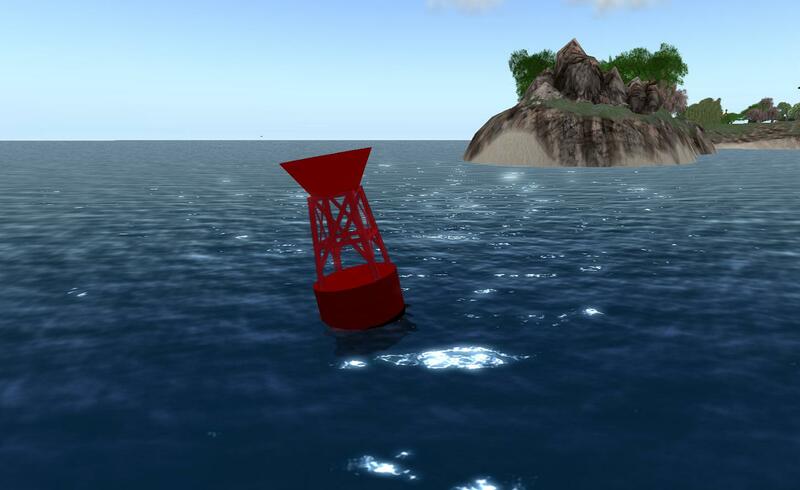 I thought of it, found an inspirational picture, built the prims, the textures and assembled the buoy in less than an hour. So I had plenty of time for a sail. I have become one of THOSE friends about whom I have warned you. You know, the kind of friend who fills your house with beach balls and sporks. /me waves to Hell. The kind of friend who has wild parties and trashes your house and steals your bed. /me waves over at Oura, Dale and Jonah. Perhaps I”m not that bad yet, but I am on my way down that path. I was wandering about my friend’s property. She wasn’t there and I was walking about under water. I discovered a posing stand. I inspected it – it was hers. I figured it was there for changing in semi-privacy. I looked about. It was VERY private down there in the ocean. It was beyond private. It was lonely. Bare. I guess I am not a minimalist. The landscape cried out to me for MORE. And I DO have rez rights there. I figured that maybe my friend would appreciate a personal shopper. *grin* The next time she came to use her posing stand, perhaps she would appreciate a suggestion for an outfit. What is appropriate attire for underwater occasions? Why, a mermaid outfit, of course. 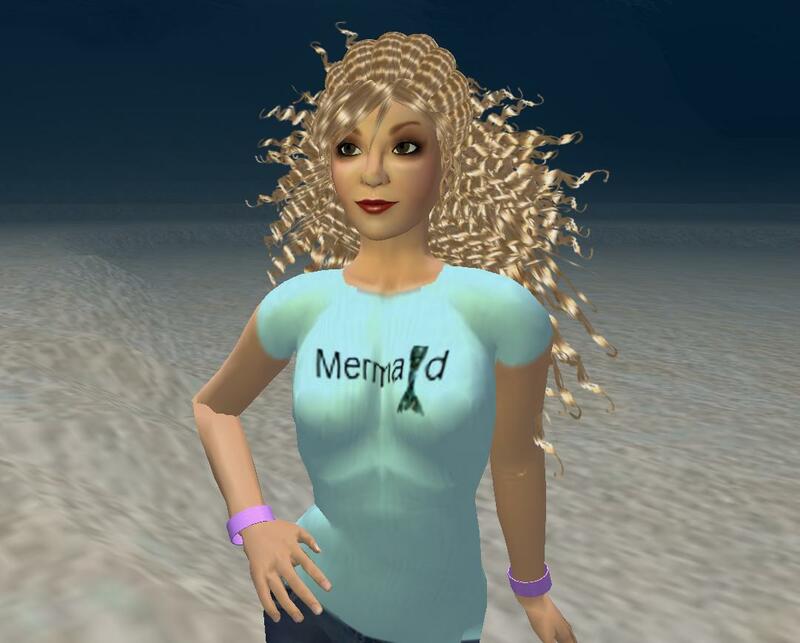 *grin* I am not up to making a mermaid outfit but I can certainly make a tee shirt. I knew exactly what I wanted. I wanted the word “mermaid” with the letter “i” being represented by a mermaid’s tail. This probably won’t sound impressive but for me it represents a major victory in so many ways. I went to the computer and looked for pictures of mermaid tails. I saw several, most of which were way too ornate for me to approximate. I finally found one that looked reasonable, that I could simplify and approximate for my use. Next I needed a texture for it and looked for fish scales for inspiration. The most amazing part was that I managed to create the tail and the filler pattern in Gimp. Without screaming, crying or swearing, all of which are the usual accompaniments to my efforts with Gimp. I have been sleeping lately. I’m wondering if there is a correlation between getting a lot of sleep/rest and being able to figure out how to use the Gimp software. *grin* I took a photo of a tee shirt on a hanger. I trimmed that up and added the mermaid text to the tee. It was amazing – I was doing what I was TRYING to do. Yes, there were a few times where I was baffled. For instance – color erase. I kept trying to use my paintbrush when what I should have selected was color-erase. 🙂 I got there. 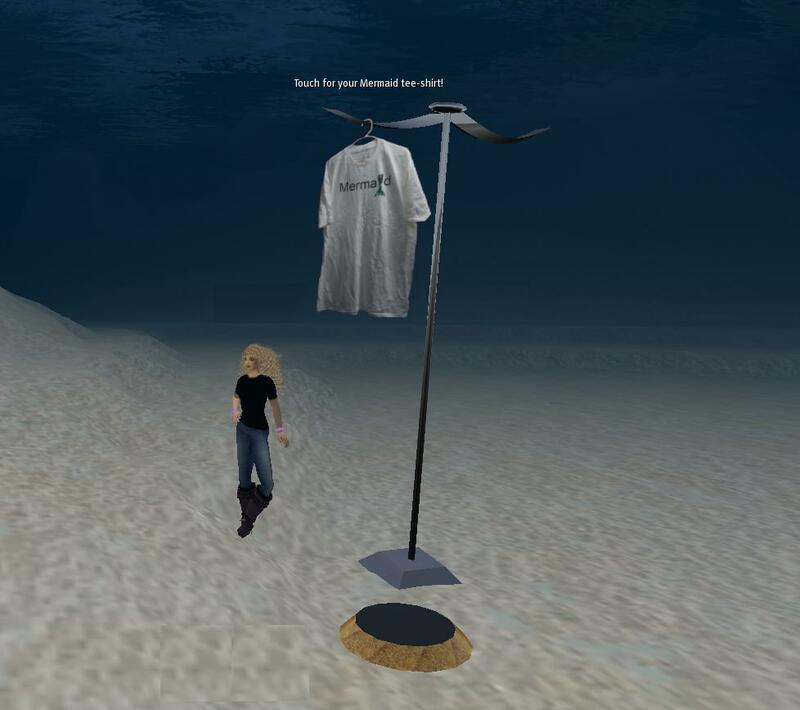 Anyway, it took me four hours to conceive the idea, make the tail, make the word, make the tee shirt texture, make the vendor prim, and make the actual tee-shirt. Yes – I cheated at the end. The picture on the hangar shows a white tee shirt with short sleeves. But when I wore that shirt, it bored me. So I trimmed the sleeves and tinted the shirt a pale aqua. No, I did NOT change the “advertisement”. Deal with it. Maybe you think that is a ridiculously long period of time. But for me, well, 4 months ago I couldn’t have done any of this except shove things into a vendor prim. Not only did I do it, but I walked away feeling satisfied and proud. Most of my landscaping work is done. The trees are built and planted, ditto the flowers and bushes. I am particularly pleased with my meadow flowers – can’t wait to show you. I’ve been wandering about giving another “once-over” to how things looked. It occurred to me that the garden social area needed something more. Else. Different. But what? Aha!!! Checkers!! That is not just a game, it is an intellectual challenge. I built a checkerboard. I built checkers. Oh, that was FUN!!! 🙂 I had a vision from my childhood of plastic checkers with crowns or something on them. 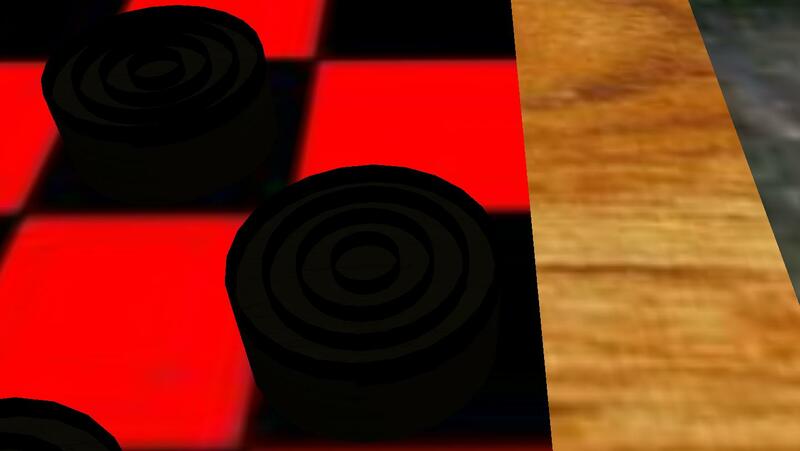 I googled for images of checkers to see what might look right to me. Wow. 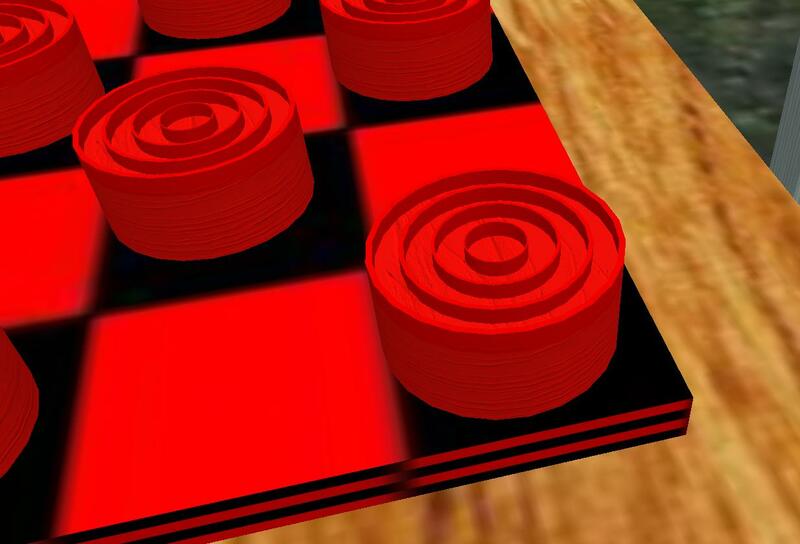 There are a LOT of different ideas for checkers out there. I saw one that had a simple geometric design. I rather liked that concept. Besides the simple elegance of the lines, I figured I could actually build something like that as opposed to crowns. *grin*. I tried a few ideas to get the concentric circles. I finally settled on a hollowed cylinder. I have yet to find any use for the ring prim. The ring simply does NOT fit MY idea of what a ring should be. Oh well. My checkerboard is not scripted. Yet. I think that for the time being I will put out a notecard that explains how to edit and move the pieces. Maybe in the future I will be brave enough to tackle scripting the pieces. 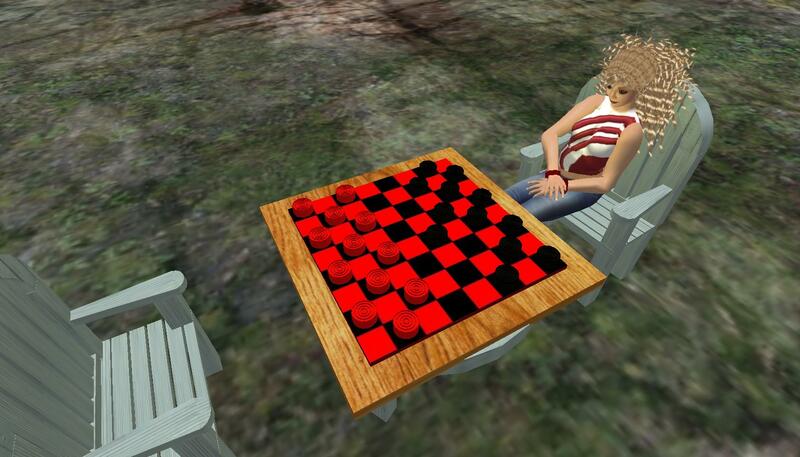 But for the time being, we can consider my checkerboard not just an amusement but a “learning experience”. *grin* Or as we say in Development: it’s a feature. /me blushes. It’s true. I swore I wouldn’t do this but it has happened. 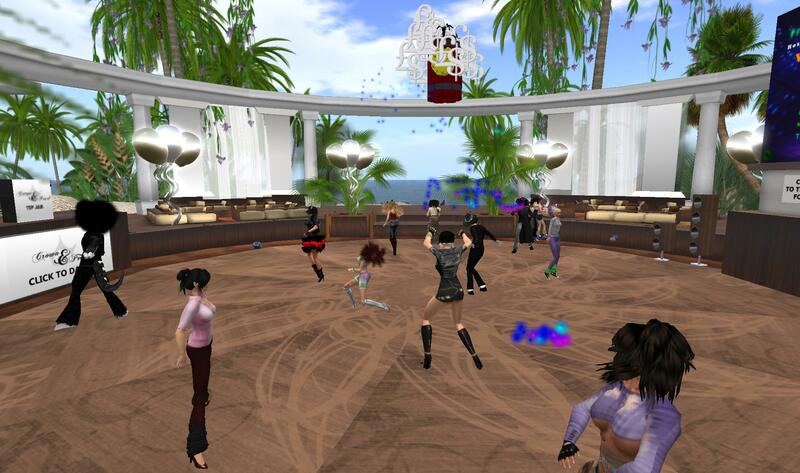 I scoffed at all the people who fell in love in SL, partnered. Even when I had more of an understanding, I still swore I would not be one. Sigh. As in so many things, I was wrong. I am in love. I have found my forever love. 🙂 His name is Bamboo. He’s a furry. Yes, even that. A furry. But my heart belongs to Bamboo. It came on me suddenly. A total surprise. I’d been thinking that yes, maybe I was ready to take this step. 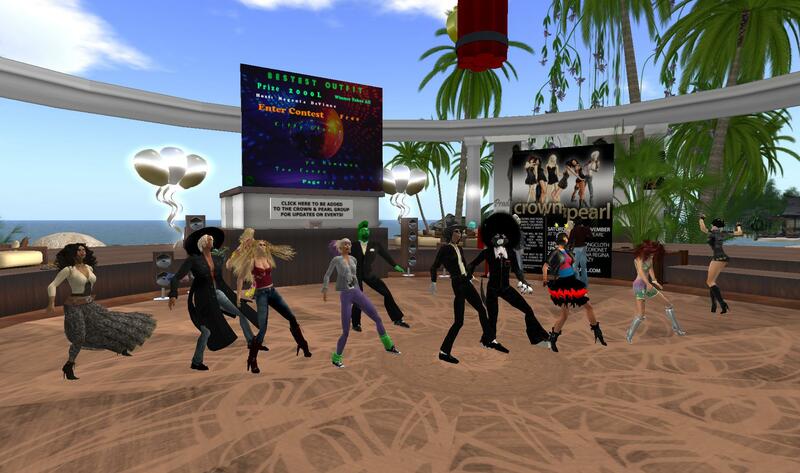 But curiously enough, I thought I’d want it in Opensim, or behind the firewall. 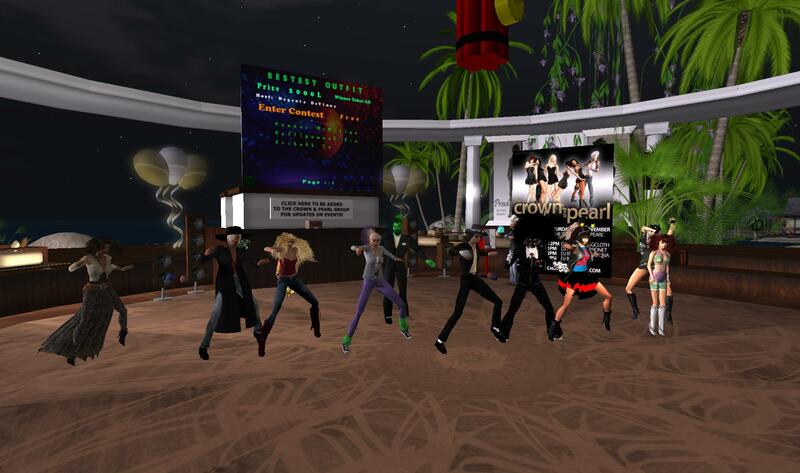 I was not prepared to fall so hard here, in SL. 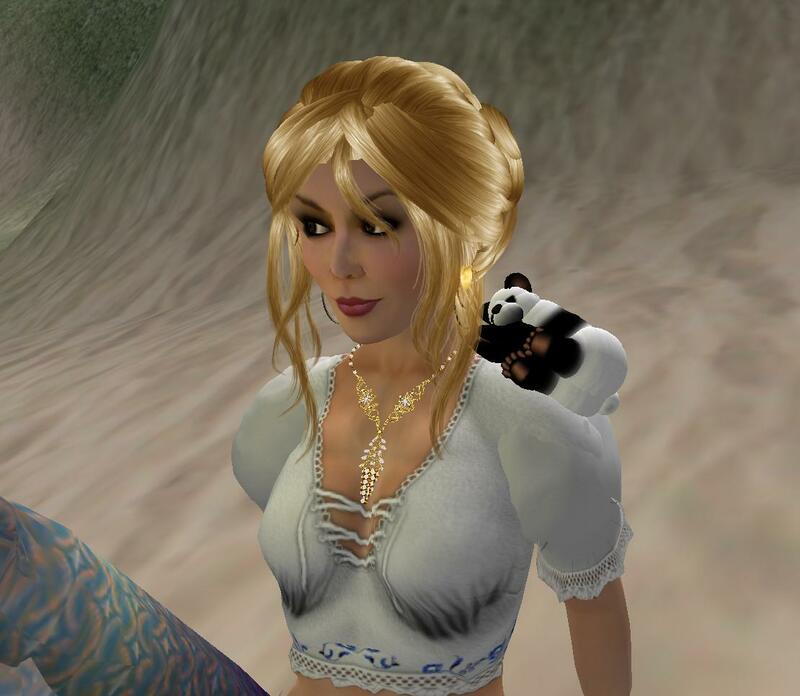 But when the announcement came through about an MM board, I thought I should give it a try, see what it would be like to have a shoulder pet of my own. I’ve been eying Faust’s dragon with growing envy. I’d been thinking that for my upcoming work conference, I’d like to stroll about with a fire-breathing dragon or a peregrine falcon on my shoulder. So I took the taxi to the MM board, even though it was neither a dragon nor a falcon. Bamboo is a panda. OMG. I LOVE Bamboo. I don’t want to be separated from him. I may never wear my hair down again. The ducks, Frenis, Bad Horse…. they are nothing next to Bamboo. He’s cute, cuddly, precious, sweet, darling. OMG. I am a total embarrassment to myself. I want him in my RL. I may have to renounce all my other virtual worlds and stay here always.